Under the 2006 constitution the Kingdom of Swaziland is an absolute monarchy, though the monarch’s power is delegated through a dualistic system with modern statutory bodies like the cabinet. The prime minister, who is head of government, and the cabinet, which is recommended by the prime minister and approved by the king, exercises executive authority. Since July 2005 the king can no longer rule by decree, though he can veto legislation and dissolve parliament. 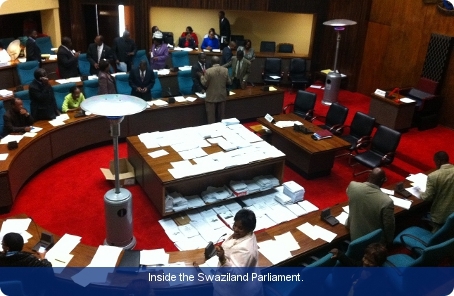 Under the tinkhundla electoral system, introduced in 1978 and amended in 1993 and 2005, the parliament of Swaziland is bicameral. The House of Assembly contains up to 69 members. Ten (including at least five women) are appointed by the monarch, 55 elected by universal adult suffrage from a list provided by the tinkhundla (tribal or community committees) and four women elected by the two houses of parliament (one from each region). The senate has up to 30 members; 10 members (including at least five women) are appointed by the House of Assembly and 20 are appointed by the king (including at least eight women). In each of the 55 tinkhundla, numerous candidates are nominated by show of hands. These are then reduced in secret ballots to three candidates per tinkhundla; the 55 Assembly members are elected in a general election. The 2006 constitution makes provision for an independent judiciary and for human rights, including freedom of assembly and association, but it makes no reference to political parties. The African United Democratic Party tried unsuccessfully to register as an official political party in that year. The legal system is based on Roman-Dutch Law. The Superior Court of Judicature, introduced by the 2006 Constitution, comprises the Supreme Court and the High Court, and is the final court of appeal. The High Court is presided over by the chief justice and has unlimited jurisdiction in civil and criminal cases. The members of the superior courts include retired judges from other African countries, traditionally from South Africa, but more recently from other Commonwealth countries. The Nguni Swazi Kingdom rose to prominence in the 19th century, under the leadership of King Sobhuza I, who enlarged the territory by conquering and absorbing numbers of non-Nguni people. Through internal stability, military might and diplomacy, Swaziland remained independent until the 1890s. It came under Boer administration in 1894. In the aftermath of the Second Boer War (1899-1902), Swaziland came under British control, and remained so until independence in 1968. King Sobhuza II reigned from 1921 to 1982 and is thought to have been the second longest-reigning monarch in world history, although he was only officially recognised as king in 1967. A staunch conservative, in 1973 he repealed the independence constitution, thus abolishing parliament and all political parties. When the king died in 1982 there was a four year delay before Prince Makhosetive acceded to the throne as King Mswati III in 1986. Elections for pre-selected candidates were held in 1998 and the king confirmed Dr Sibusiso Barnabas Dlamini as prime minister. Dr Dlamini was succeeded by Absalom Dlamini, in 2003, who went on to serve for five years. In the first elections under the 2006 constitution, a new parliament was elected in September 2008. The election was observed by a Commonwealth expert team. The king appointed Dr Sibusiso Barnabas Dlamini again as prime minister.